How often should I tag my bank transactions? Client payments (usually allocated to a sales invoice). Supplier payments (usually allocated to a purchase invoice). Tax payments, e.g. Corporation Tax, PAYE or VAT. If none of the preset options are a perfect fit you can also post directly to a nominal ledger of your choice. You can tag items individually or in batches of up to 50. QuickFile will take you through a simple wizard and automatically create the backing invoices, client/supplier records and bank movements. In a nutshell, Bank Tagging allows you to work through large periods of bookkeeping in no time at all! Once you have uploaded your bank statement click on the Tag Me button for one of the new entries. A small window will pop up with numerous options. The precise options will depend on whether the transaction is a debit (money out) or a credit (money in). In our example lets assume we have selected a payment that was made to a supplier for goods/services. So in this case we need to choose the option “Payment to a supplier”. You can now select an existing supplier to tag this transaction to, or you can create a new one by just typing in the name. You have now successfully tagged a transaction, it should now be green and marked as Tagged. If you click the green Tagged button you’ll see a brief summary of where the funds were allocated. 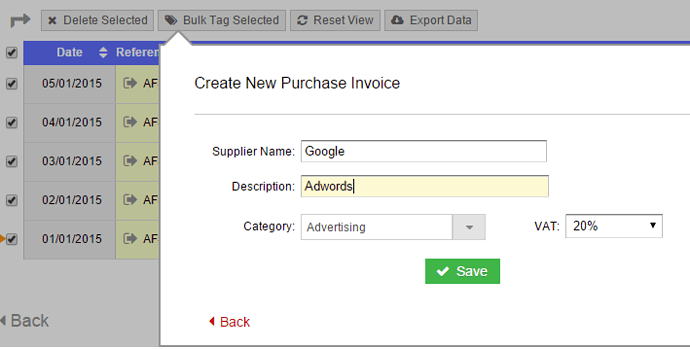 You can even drill down on the invoice or supplier record and add additional information should you wish. Bulk tagging works in much the same way as single tagging, but allows you to select up to 50 items at a time on your bank and apply the same explanation. First you need to find a set of transactions that relate to the same client, supplier or transfer. Within the QuickFile bank statement screen you will see a magnifying glass for each bank statement entry. This will allow you to search for similar transactions and to then drill down into those matching entries. You can also perform an advanced search by clicking the orange button above the statement preview. 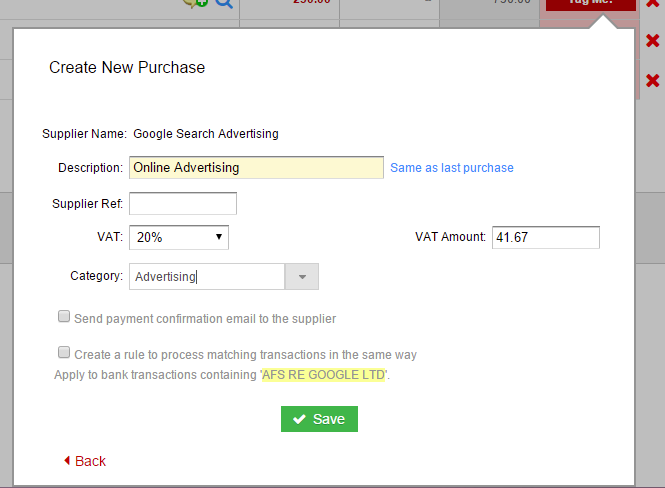 You can now select all the items using the corresponding check boxes and then click the ‘Bulk Tag Selected’ button. You will see a series of options similar to those available on the individual tagging pop-up. With the items selected all you need to do now is follow the options on the wizard, as you would on the single tagging process. Once confirmed all your backing records (e.g. sales or purchase invoices, transfers etc) are automatically created. 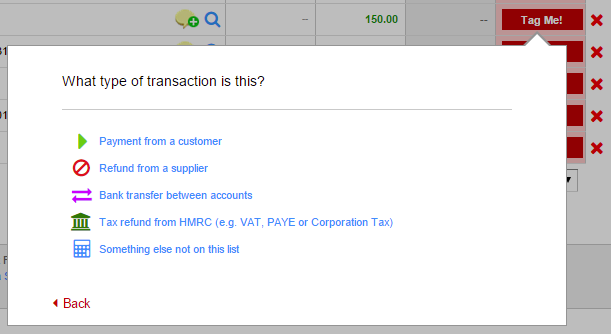 Don’t forget to keep an eye on the tagged transaction count in the top right-hand corner of your QuickFile statement. This will allow you to visually see how many of your transactions still need to be tagged. 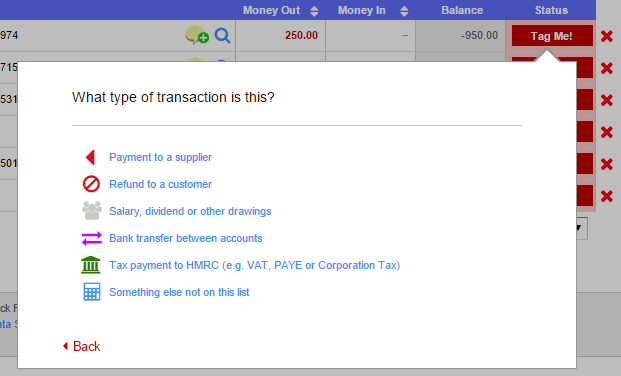 You can even click on the tick boxes next to the count to hide or show tagged or untagged transactions. Do you have many repeat payments to suppliers, bank transfers or client receipts? If so you may want to setup some auto tagging rules on your account to fully automate the bank tagging process. Auto tagging works by allowing you to match transactions that either start with, contain or end with a particular name/reference. You can then tell QuickFile how such matching items should be tagged. You can find out more about automatic bank tagging here. Ideally you should keep your bank transactions tagged from one month to the next. At the end of a given month it is advisable to import your most recent bank statement information and to tag the transactions there and then. A more accurate answer to this question however will depend on how many transactions occur in your business within a given month. If you only have a handful of transactions to process in one month you may want to complete this process on a quarterly basis. You will only be able to obtain useful reporting information when the corresponding period is brought up-to-date. You must ensure that all transactions have been tagged within three months following your year-end date (for Limited Companies). This will give our accountants ample time to prepare your annual accounts. Bank tagging is a really fast way to complete your bookkeeping. It will allow you to quickly tell us about your transactions and what they relate to. As you tag your transactions, watch your Chart of Accounts report come alive!